Peppermint Flower Water - USA - Distilled water infused with Peppermint essential oil. 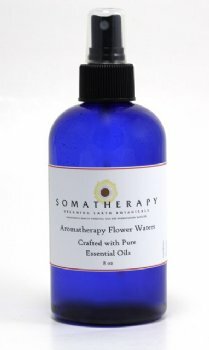 Flower Waters are very mild, have a gentle fragrance, and are quite refreshing when sprayed on the face and body. Peppermint flower water is especially refreshing and is a great spritzer to take along when traveling or to use in hot, sticky weather. Four and eight ounce sizes come in a cobalt blue bottle with atomizer top. Larger sizes are refill, and do not include a spray top. Review: I am very happy with this product, however, was pretty upset to find that I paid 12.99 for this at a local hospital gift shop and then went on your Web site and found it there for 7.00 for the same 4 oz bottle!!!! !